Connecticut, along with Texas, Indiana, Rhode Island and North Carolina, recently entered into agreements with Infosys, an Indian outsourcing company, wherein the states promised to give Infosys state grants or tax breaks in return for the company’s promise to create certain jobs. 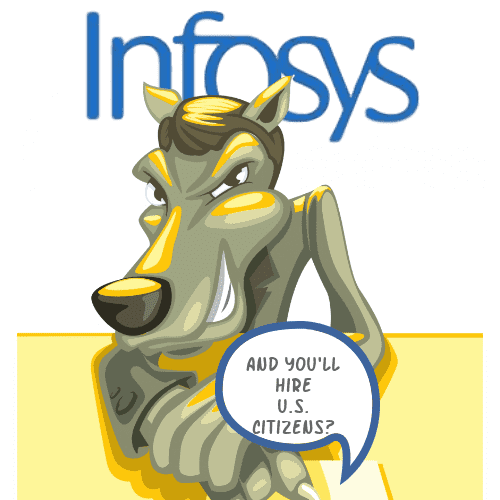 The agreements have been questioned by various American worker groups concerned that those jobs won’t go to Americans and that Infosys will merely ship in more foreign workers, as it has done historically. A protest rally in Hartford, Conn., last Saturday brought media attention to the issue and highlighted the concerns for American workers. In response, an Infosys spokesperson said the jobs were “100 percent for American workers.”That might satisfy even those concerned with Infosys’ poor track record that favors non-American workers, and Americans might even be tempted to think Infosys had learned a lesson and perhaps changed its outsourcing habits. But, buyers beware! Infosys is attempting to sell its custom-made, self-manufactured definition of “American workers” as “visa independent.” This newspeak may be an attempt by Infosys to hide its efforts to continue conducting business as usual, which means hiring Indian workers. Dictionaries define “American” as an American citizen. Citizens have the right to vote in local, state andfederal elections, run for public office and, of course,live and work in the U.S. But Infosys wants you to buy its newly contrived visa independent definition, which could be interpreted to mean a few different things. It’s possible it could mean American citizens. It could mean “regardless of whether that worker – who is in America – is on a work visa, or not.” Assuming for the sake of argument that Infosys did not include illegal workers, that leaves foreign “guest workers” brought in to the U.S. via work visas such as H-1B, L-1, O, J-1 or F-1 foreign students with work authorizations for OPT (Optional Practical Training) or CPT (Curricular Practical Training). Infosys does this a lot. Or, perhaps “visa independent” means “visa free” which would encompass the newly minted green card holders who are legal permanent residents (LPRs). But, a green card holder does not an American make. . . Likewise then, if Connecticut’s contract with Infosys said the company would be eligible to receive $4 million if 200 jobs were created, did the contract state who those jobs would be for? Was there a meeting of the minds? 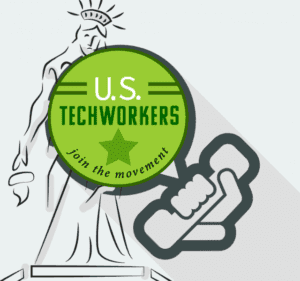 Or was Infosys’ recent and emphatic statement – “These jobs are 100 percent for American workers” – just an attempt to bypass an extremely uncomfortable topic? If, for example, Conn. Gov. Lamont (or his predecessor) had in mind that the jobs were for American (citizen) workers, and if the Infosys person (signing the contract) had in mind a contrived “visa independent” definition of American worker, then a court of law could conclude there was not a meeting of the minds, and the contract may be unenforceable. If, on the other hand, both parties agreed that the jobs would NOT be for American citizens, then Gov. Lamont, along with his fellow governors making deals with Infosys, have another contract to worry about: The implied contract with the American citizens and voters in their states. This entry was posted in H1-B News, Updates and tagged american workers, deals, h-1b, incentive, infosys, l-1, opt, package, states, taxes, visa, visa independent.